"Sometimes I'm afraid to look back," he says. On November 27, 1997 the sports news was happening because the First Division referees announced a strike for the following weekend. In fact, they kept their word and the day was refereed by young people of Segunda B. It was the way that the collegians found to protest the criticism of all the teams, but especially of Jesús Gil , then president of Atlético de Madrid. On November 27, 1997, José María Aznar , president of the Government, knit a pact for employment with the unions. November 27, 1997 was Thursday, but there were Champions. On November 27, 1997, then, its history began in this competition one of the most successful goalkeepers in world football, perhaps the best in history. In short, that on November 27, 1997, Iker Casillas was registered for the first time in a record of a Champions League match. The day before, a very young Iker, then only 16 years old, went, as always, to the Cañaveral de Móstoles institute. That morning, which seemed to be one more, ended up becoming the beginning of everything. That was the beginning of the European adventure of the player with more games (173) and more seasons (20) in this competition. Of course, in Real Madrid he played the glory with three titles (2000, 2002 and 2014), and now in Porto he continues enlarging his legend and breaking all records. Heynckes , Madrid coach that November 27, 1997, sent for Iker to go to Barajas in a hurry and fly with the first team to Norway. On that occasion, against Rosenborg, he saw the match from the bench. He had to wait almost two years to make his debut in the top club competition with the team of his life. It was on September 15, 1999 in Athens, in a draw (3-3) against Olympiacos. Now, 20 years later, his name has become a legend. 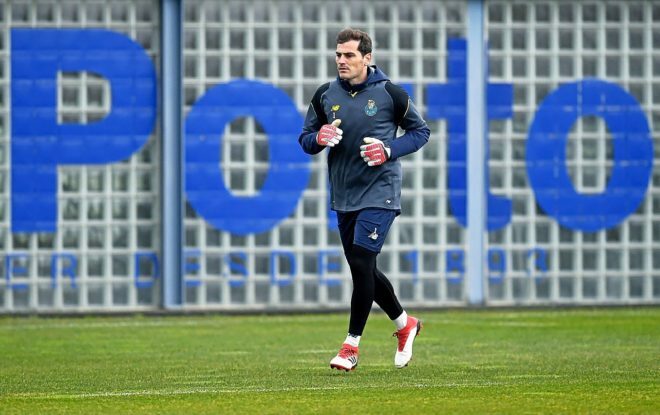 All the fans of the king's sport - well, almost all - recognize Iker Casillas as one of the best goalkeepers in the history of football and, of course, the whole of Chamartín. In addition to his three titles, he has passed the group stage 19 times. The one that more. Nobody has played so many times the round of 16 that start on Tuesday for him in Rome. He also shares the award for most victorious player (100) with Cristiano Ronaldo , a number he achieved last December, when Porto won Galatasaray in their own field (2-3). At 37, he fights every day against the passage of time and against the rumors that, for example at this point last year, placed him outside Oporto, on the way to some exotic destination that would freeze his figures in the Champions forever. However, he renewed and, after having a bad time last year, today he is the undisputed holder in Porto, and from time to time even the summaries spit out some of those impossible stops in the house. Those that began to become famous in the 2002 final against Bayer Leverkusen, when he appeared for Cesar's injury. Two stops with the foot prevented the Germans from sending the match to overtime. His interventions and his tears presented him before the world as the goalkeeper that would mark an era. Now, perhaps - again - in his last season in European football, he keeps the illusion intact of that boy who ran out of class to join Seedorf, Mijatovic or Morientes . This Tuesday he plays the first leg of the last 16 against Roma and will play this round for the nineteenth time. They are 19 out of 20 -only in their first year in Oporto, the 15/16 course, they did not pass the group stage- and nobody matches them. «Sometimes I'm afraid to look back because there are many games, many moments. I'll keep the titles, that's it ».